This article is about Air. For other uses of the term Air, please see Air (disambiguation). For more information, see: Earth's atmosphere. Air is a colorless, odorless and tasteless mixture of gases consisting mostly of nitrogen (N2) and oxygen (O2). It is the part of Earth's atmosphere that humans and all other animals breathe in order to obtain the oxygen needed to sustain life. The Earth's atmosphere not only contains the air we breathe, it also holds clouds of moisture (water vapor) that become the water we drink. Furthermore, it protects us from meteors and harmful solar radiation and warms the Earth's surface by heat retention. In effect, the atmosphere is an envelope that protects all life on Earth. The air may contain pollutants that originate from a variety of sources such as our industries and our vehicles, and can directly or indirectly affect our health and the natural environment. 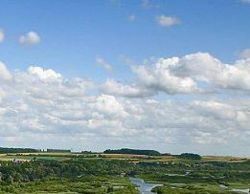 These effects may be experienced near the sources of air pollution and some air pollutants may be transported long distances by the wind, even across political boundaries. For more information, see: Atmospheric chemistry. Water vapor is not included in the above dry air composition, and it varies up to a maximum of 4 volume percent. The total volume percent of the listed gases does not equal exactly 100 percent because of rounding of the numbers. Dry air has a molecular mass (molecular weight) of approximately 28.97 and the adjacent table lists the concentration of 14 gases present in filtered dry air. Two of the gases, nitrogen and oxygen make up 99.03 percent of clean, dry air. Note the amounts of greenhouse gases that are present: water vapor, carbon dioxide, methane, nitrous oxide, and ozone. Additional gases (not listed in the table) are also present in very minute amounts. The atmospheric air is rarely, if ever, dry. Water vapor is nearly always present up to about 4% of the total volume. In the deserts regions, when dry winds are blowing, the water vapor content will be near zero. This climbs to near 3% on extremely hot/humid days. The upper limit of 4% is for tropical climates. Unfiltered air contains minute amounts of various types of particulate matter derived from sources such as from dust, pollen and spores, sea spray, volcanoes, meteoroids and industrial activities. Light is electromagnetic radiation that travels in waves of vibrating electric and magnetic fields and is a small part of a larger range of vibrating electromagnetic fields called the electromagnetic spectrum. Visible light is electromagnetic radiation visible to the human eye and is only a small part of the electromagnetic spectrum. Light from the sun looks white, but is actually a combination of many colors. The colors blend continuously into one another. At one end of the spectrum are the red colors which have the highest wavelength and therefore the lowest frequency. At the other end of the spectrum are the blues and violets with the lowest wavelengths and therefore the highest frequency. As light from the sun travels through Earth's atmosphere, it bumps into a bit of dust or a water droplet or a gas molecule. Dust particles and water droplets are very much larger than the wavelength of visible light. When light bumps into them, it gets reflected and bounced off in a different direction but the reflected light still appears white because it still contains all of the same colors it had before it was reflected. However, gas molecules are much smaller than the wavelength of visible light. When light bumps into a gas molecule, it behaves differently than it does when it bumps into a dust particle or a water droplet in that some of the colors in the light are actually absorbed by the molecule. Subsequently, the molecule radiates or releases the light in a different direction. The colors in the radiated light are the same colors that were absorbed. The higher frequency colors (blues and violets) are absorbed more often than the lower frequency colors and this phenomena is called Rayleigh scattering. It was named after Lord Rayleigh, an English physicist who first described it in the 1870's. Thus, the lower frequency (higher wavelength) red, orange and yellow colors in the light from the sun mostly pass right through the atmosphere and are unaffected by the air. The higher frequency (lower wavelength) green, blue and violet colors in the light from the sun are absorbed by the gas molecules in the air and are scattered across the sky. That is why a daytime sky, absent stormy or other meteorological conditions, appears blue to the human eye. For more information, see: Nitrogen cycle. The nitrogen cycle is a complex system. The nitrogen in the air is also essential for life on Earth. It is incorporated into amino acids and proteins, and is part of the nucleic acids, such as DNA and RNA. In plants, nitrogen is used in chlorophyll which is essential for photosynthesis and further growth. However, the free nitrogen in the atmosphere is mostly unusable by plants. Since nitrogen is inert, it requires considerable energy to remove nitrogen from the air. The process by which nitrogen in the air is extracted to be useful for living things is called "nitrogen fixation" which may be the result of natural events, or biological fixation by microbes either alone or in relationship with certain plants or animals, or by industrial activity. One way nitrogen is fixed is by atmospheric lightning strikes; these have the enormous energy needed to break inert nitrogen molecules into atoms, which combine with oxygen to make nitrogen oxides; these, in turn, can dissolve in rainfall, forming "nitrates" that fall to the Earth. A second way, which accounts for most nitrogen fixation, is when symbiotic bacteria having the nitrogenase enzyme combine gaseous nitrogen with hydrogen to produce ammonia (NH3) which, in turn, is further converted by the bacteria into organic compounds. Some nitrogen fixing bacteria, such as Rhizobium, live in the root nodules of legumes plants and work to produce ammonia in exchange for carbohydrates. A third way to fix nitrogen is by an industrial process (see Ammonia production) which uses high pressure and temperature as well as a catalyst to combine atmospheric nitrogen and hydrogen to form ammonia which can be used directly as fertilizer or processed further to yield urea ((NH2)2CO) and ammonium nitrate (NH4NO3) fertilizers. This industrial process enables humans to grow more food than would otherwise be the case, but there is concern that this activity is disturbing the natural cycling of nitrogen. The atmospheric nitrogen fixed by natural and man-made activities circulates through the atmosphere, down into the soil of the Earth's crust as well as into the lakes, streams, reservoirs and oceans of the Earth from which it is eventually returned to the atmosphere. The nitrogen cycle is an example of a biogeochemical cycle similar to the water cycle. There is speculation that these different cycles may be related to each other, and may influence each other in ways yet unknown; scientists continue to explore how these cycles affect each other. ↑ Arya, S. Pal (1998). Air Pollution Meteorology and Dispersion, 1st Edition. Oxford University Press. ISBN 0-19-507398-3. ↑ Barrat, Rod (2001). Atmospheric Dispersion Modelling: An Introduction to Practical Applications, 1st Edition. Routledge. ISBN 1-85383-642-7. ↑ Pielke, Roger A. (2013). Mesoscale Modeling, 3rd Edition. Academic Press. ISBN 978-0-12-385237-3. ↑ Beychok, Milton R. (2005). Fundamentals of Stack Gas Dispersion, 4th Edition. Self-published. ISBN 0-9644588-0-2. ↑ 6.0 6.1 6.2 6.3 Why is the sky blue? From a page on the website of "Science Made Simple". ↑ 7.0 7.1 7.2 7.3 Why is the sky blue? From a page on the website of the "University of California, Riverside". ↑ The Nitrogen Cycle From an online biology textbook by John W. Kimball, retired professor of biology at Tufts University, Massachusetts. Accessed March 26, 2010. ↑ CHM 110 - Chemistry and Issues in the Environment An online lecture for an online chemistry course published by the chemistry department of Elmhurst College, Elmhurst, Illinois. Accessed March 26, 2020. ↑ The Nitrogen Cycle 2008, Paul Billiet. From the Open Door Web Site , a reference source for both students and teachers. 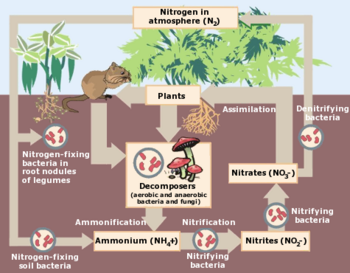 ↑ The Nitrogen Cycle: Nitrogen Transformations in Soil, Water, and Air. From a website page of the National Aeronautics and Space Administration (NASA). This page was last modified 21:34, 8 August 2014.